Rachel Lederman represents persons whose rights have been violated by police or government misconduct, prisoners, activists, “delinquent” youth, and tenants. She has defended hundreds of progressive demonstrators in court, and has obtained significant victories in impact litigation to stop police and government repression and civil rights violations. 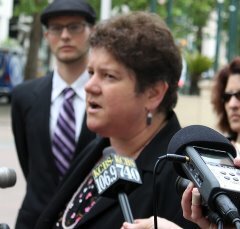 Most recentl y Rachel Lederman and Jim Chanin settled Scott Olsen’s lawsuit against the City of Oakland for $4.5 million. Scott Olsen, an Iraq war veteran, was shot in the head with a lead-filled “beanbag” round during an Occupy Oakland demonstration on October 25, 2011. His skull was shattered and he sustained permanent brain damage. The shooting violated Oakland Police crowd control policies that Rachel helped overhaul in 2004, as part of an NLG / ACLU legal team who sued on behalf of antiwar demonstrators who had been shot with “less lethal” munitions at the Port of Oakland. Rachel and other NLG lawyers sued to enforce these policies in Spalding, et al. v. City of Oakland, a federal civil rights class action lawsuit arising from the mass arrest of 150 Justice for Oscar Grant protesters in 2010, and in Campbell, et al. v. City of Oakland, which challenged OPD’s use of “less lethal” munitions and other excessive force against Occupy Oakland on October 25 and November 2, 2011. Spalding and Campbell settled in July, 2013, for a total of approximately $2.2 million and a stipulated court order enforcing the OPD Crowd Control Policy for a 4-7 year period, exonerating the arrestees, and changing OPD and Alameda County Sheriff mass arrest procedures. Rachel, Bobbie Stein and Dennis Cunningham settled another case stemming from the OPD violence toward Occupy, Sabeghi v. City of Oakland, for $645,000 in December, 2013. Rachel is the President of the National Lawyers Guild, S.F. Bay Area Chapter, co-chair of its Demonstrations Committee, a past co-chair of the NLG’s Post-9/11 Committee, and a member of the NLG National Police Accountability Project. She has rece ived the NLGSF Unsung Hero award, and awards for pro bono work. She is a graduate of Cornell University and New College Law School, and has been a practicing attorney since 1987. Rachel receives court appointments throughout the State of California to represent the indigent on appeal from felony convictions, juvenile adjudications and involuntary commitments. She also accepts private criminal and civil rights appeals from other attorneys and private clients.